After a winter of dealing with ridiculously dry air (in which the most ambitious beauty decision was which heavy-duty lip balm to reach for), we all feel a little more alligator than human. But with spring, comes new beginnings—including for your makeup and skin-care situation. And you don’t have to leave your meditation mat to get in on it. 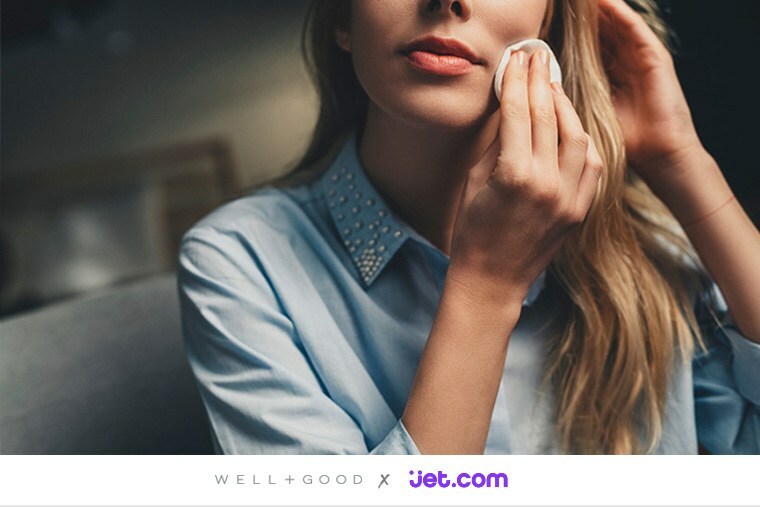 With tons of buzzy brands upping their natural-leaning offerings, the Internet is basically your personal primping playground—and we found the next spot you’re going to want to scour: Jet.com. Not only can you peruse its virtual beauty aisle without actually having to leave your house (let’s face it, it’s not that warm out yet), it’s got tons of natural-focused products so you can load up on organic, vegan, and gluten-free lotions and potions to your heart’s content. We did a deep dive into the one-stop-shop’s comprehensive selection of beauty essentials to round up our faves—and to sweeten the deal, you can snag 15 percent off your first three orders of health and beauty essentials with code WELLANDGOOD15. * DIY spa day, here you come. Scroll down to see our 12 curated picks for shiny hair, hydrated skin, and upgraded selfie goals this spring. Step one: Get rid of any and all dead skin cells. This exfoliating cleanser nixes rough patches with ingredients like organic sea kelp, lemon peel, and French green clay—leaving your skin smooth and soft (goodbye, crocodile vibes). Remember when your mom used to tell you to drink orange juice when you were sick for an extra dose of vitamin C? Works on winter skin, too. The nutrient’s known for it’s ability to even skin tone and brighten your complexion, while hyaluronic acid gives you the seriously moisturized #nofilter palette. Get a breath of fresh air—in your face. An on-the-go hydrating spritz is essential for springy feels to give thirsty skin a boost, and even works to set your makeup. To ensure all your pampering efforts aren’t for naught, this next-level tool uses a gently exfoliating brush to help open up pores, meaning your nutrient-dense slathering can be properly absorbed. Winter can be brutal for your hair, too—but the marula oil and coconut water in this shampoo will help calm the dried-out strands you’ve been hiding under that cute beanie all winter. Showering with this stuff promises a major hair reboot. Organic argan oil delivers hydration straight to the root, helping you accomplish your shiny hair #goals. Looking for an all-in-one answer to your dry skin problems? Jojoba oil has you covered. Literally, you can cover yourself in this organic, cold-pressed oil for vibrant skin, glossy hair, and stronger nails. Spring means flip-flops weather is nigh, so make sure you’re ready to see the sun with this head-to-toe coconut oil balm. And because coconut oil is basically a holy-grail beauty booster, you can also use it to appease parched tresses. Not only will a swipe of lip gloss highlight your now totally glowing skin, this beeswax-powered gem can actually help heal months of chapped-pout problems. Get bright-eyed and bushy-tailed—with an emphasis on bright-eyed—with this soothing eye massager. It uses gentle pulsing technology to illuminate eyes and decrease puffiness, no matter how late you stayed out last night. Polish off your makeover with a fresh mani courtesy of a vegan formula. This water-based solution wipes away with rubbing alcohol, rather than harsh nail polish remover—so you can keep chemical fumes from killing your spring vibe. *Code is for new customers only. Maximum discount $30. Order minimum of $35. Offer expires 7/1/2017. See jet.com/promo-terms for details.